For impromptu entertaining on a summer evening, this is your salad, your side dish, your everything. So just throw some steaks on the grill and you’re all set. Or even better, start a beer-can chicken roasting on the grill while you make this salad. It will take you a little bit of time to prep the vegetables, but prepared pesto (preferably a good one from the farmers’ market or one made locally) is a time-saver here. Actually, if you’re not in the mood to make your own pesto over the summer, you should do a taste comparison of several brands to find your “house” pesto. That may seem kind of crazy—buying several and tasting them side-by-side—but you will be blown away by the differences. Some of the national brands are, well, to be polite, not good. Some are overly salty, some have no basil flavor (if you get stuck with one of those, just add more fresh basil to this salad). But more often these days, you can find good locally made pesto in neighborhood and farmers’ markets. You may not be in the habit of using whole or torn herb leaves in a salad, but with basil, in particular, larger pieces give you a welcome burst of flavor without the bitterness that comes when basil is chopped too much (especially with a dull knife). I like the mozzarella balls that are about the size of a large cherry tomato, because when quartered, they make nice little bite-size wedges. 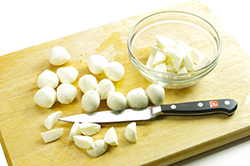 But you can certainly use any fresh mozzarella and cut it into appropriately sized pieces. 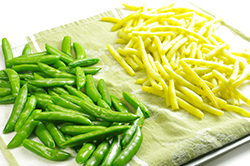 If you can’t find yellow wax beans or snap peas, you can substitute green beans (fresh, slim ones, please) for either. 1. 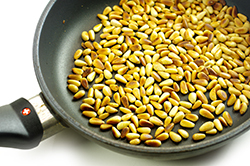 Fill a large saucepan two-thirds full with water and add 2 tsp. salt. 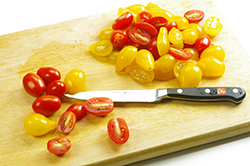 Arrange a few layers of dish towels on a work surface or a sheet pan to drain the beans and peas. Add the beans to the boiling water and begin timing immediately. 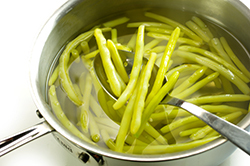 Boil until the beans are tender to the bite, 4 to 8 m inutes. (Begin tasting after 4 minutes; the timing varies greatly, depending on the age of the beans and how quickly your burner returns the water to a boil.) Use tongs to lift the beans out of the water and spread them out on the towels to let them cool and to let excess moisture evaporate. 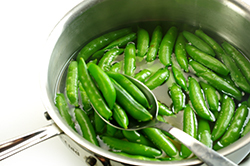 Put the snap peas in the boiling water and cook until they’re bright green and just slightly softened, about 2 minutes. Drain on towels and let cool. 2. Season both the tomatoes and the mozzarella with a pinch or two of salt. 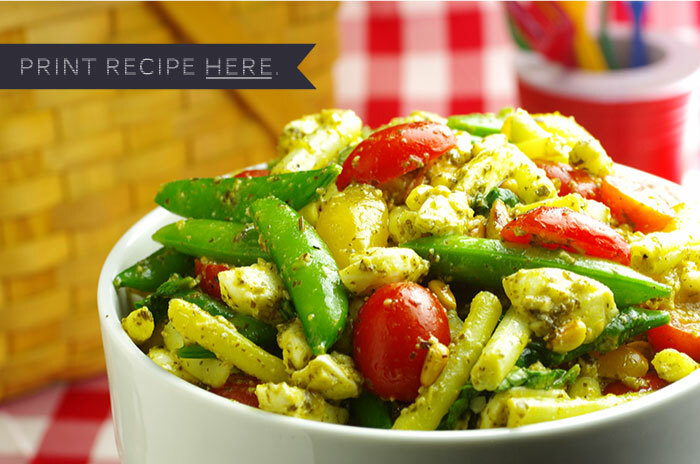 Put them in a large mixing bowl and add the wax beans, snap peas, and 3/4 tsp. salt. 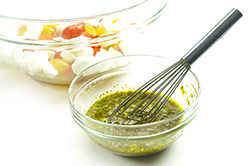 In a small bowl, whisk together the pesto, vinegar, 1/2 tsp. lemon juice, and olive oil. Pour over the vegetables and mix and toss well. 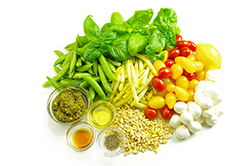 Add the pine nuts and basil and season with several grinds of fresh pepper. Toss well and let the vegetables sit for 5 to 10 minutes. Toss again and taste, adding more salt, pepper, or lemon juice as needed.